Sisterly love is a special bond that cannot be broken. Show your love with a necklace that displays that special bond. 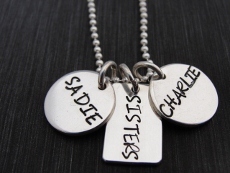 A sterling silver rectangle is stamped with SISTERS. Choose discs or rectangles for names or initials to add to the necklace. Necklaces are hung on a sterling silver ball chain in 16", 18" or 20" lengths.